One of our Public Talks at 518 Valencia, Fall 2013. We launched Shaping San Francisco's digital archive at Foundsf.org in 2009. Since then the number of our users has grown to over 35,000 per month! Foundsf.org is a free public resource. We may look professional, and we ARE professional historians, but what you see mostly relies on volunteer labor to make it happen. No, we will never sell advertising space on this site, nor are we sponsored by companies or major patrons. We won't become rich through cultural production, but we DO want to stay relevant and sustainable. For this we turned to you, and you helped us raise over $22,200!!! We know you want Foundsf.org to exist for you and others discovering and shaping San Francisco's history. We thank all who helped us by becoming part of the 3% Solution. Several dozen people signed up for our new monthly donor program, or gave us a one-time gift to say thank you for the photos and stories. We got close to our goal of raising $2,000 per month for the year, and we are humbled and grateful! •	Curation of new material to the archive at Foundsf.org. •	10 bicycle and 6 walking tours a year highlighting areas of local history. •	Guest lectures, bike and walking tours for classes at local universities and high schools. •	Ongoing Public Talks 2-3 times a month September - May (archived Talks since 2006 are available here — they are FREE to download). •	Collaborative work with other local and neighborhood history groups. Shaping San Francisco has existed since the late 1990s, and is committed to excavating the lost history of San Francisco's residents, landscape, and economy. We see history as a creative act in the present, and want to make it available to you. Thanks to all who have become part of our hardy band of dedicated supporters! You can still sign up to be part of this effort by clicking the Donate button in the navigation bar at left! Your donation to our efforts is tax deductible (we operate as a project of Independent Arts & Media, a California nonprofit 501(c)3 corporation). We will send you one of our books (3 to choose from!) as a thank you gift for signing up at $10/month—or more (you can impersonate 2, 3 or more people by making your monthly donation a multiple of $10!). You will also be able to join our Bicycle and Walking Tours as our invited guest as a sustainer. You can also give us a one time gift to say thank you for the photos, stories, and events. 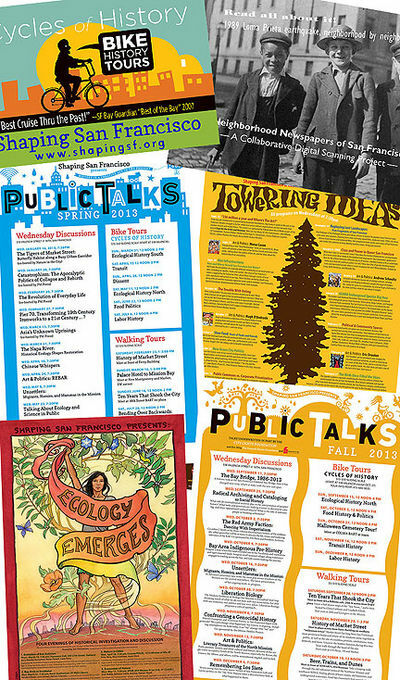 We understand that providing free resources like our Public Talks and our digital archive at Foundsf.org is easy to take for granted. And we don’t want to guilt-trip our users, or put a paywall in front of it and make everyone who comes looking for San Francisco history pay. We do think there are enough enthusiastic supporters like you who understand the drama facing independent media and independent historians and see the work we’re doing as a vital public good worthy of steady support. Shaping San Francisco is supported by individual donations and small grants, key to covering the cost of everything from our internet bills to rent for our Talks space and our small office. The two co-directors earn a modest monthly stipend. Given how many hours we work on the project, this works out to just under San Francisco’s minimum wage of $10.24 per hour. History is (or should be) the air we breathe, the water we drink, the nourishment that keeps us connected to our lives where we are. It's a public utility! But no one pays for it like they do their electricity bills or water bills. Won't you join us in sustaining this vital public asset?